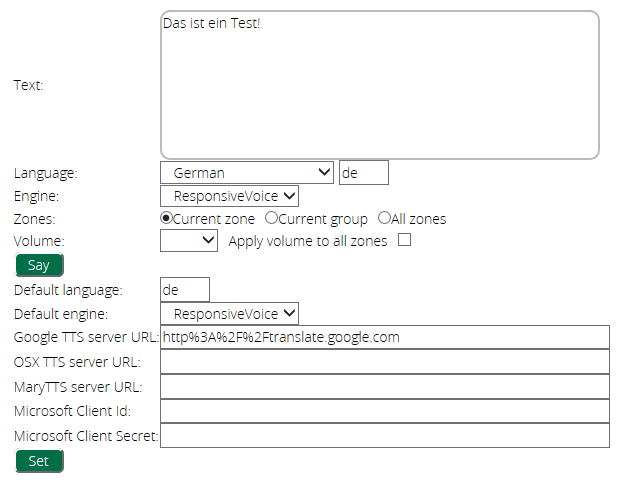 Anyway I’m using ResponsiveVoice instead of Google and direct TTS is working fine. Is it possible in general to use TTS in a scene or do I have to use a LUA script? Anything else I could try to make it work in a scene? Odd. Have you typed the URL in manually or are you copy <> pasting? Do you think that that the Google URL affects the output via ResponsiveVoice? I believe the value for Engine in your scene action should be “RV” not “ResponsiveVoice”. The latter is what shows on the menu in the plugin (the human-readable text for the option), but the key value that the UI sends to the action is actually different. I’ve set the Engine to RV. Seems to work. The script also runs fine in “Test Luup code” and in Scene. Is it possible to realize the following scene (with LUA)? -- (whether armed or disarmed--you always want to know). -- and language as needed. -- we check the sensor state each time or it will never stop talking. local status = luup.variable_get( "urn:micasaverde-com:serviceId:SecuritySensor1", "Tripped", SensorDeviceNum ) or "0"
-- Give TTS warning on Sonos. -- Delay and call this function again. -- Since we are triggered by the detector, start off with the first warning. This code also writes start and stop messages to the Vera log, so you can see it running there. Cool. Just be aware that if you run the scene directly (with the “play” button on the scene list), it likely will not speak. That’s because it checks the sensor status before speaking, so it knows when to stop speaking, so if you just run the scene and the sensor is not tripped, nothing will happen. Das stimmt so, aber nur ein bisschen.